I need some help. I’m in a rut. I know as a food blogger I’m supposed to be a wealth of culinary ideas and inspiration, but lately I can’t figure out what to cook for dinner. Maybe I need a new cookbook, something new to muse over and gain ideas. Maybe I need to find time to go to the grocery store on a regular basis so I have ingredients to work with. Its like I have writers block, but instead of not being able to string two sentences together, nothing makes my hungry. 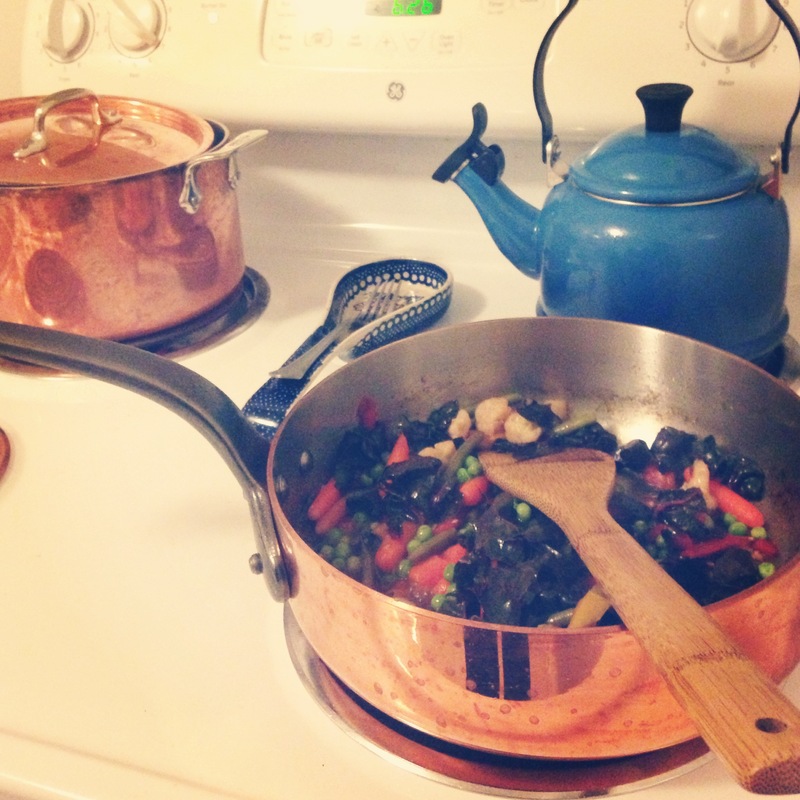 When I was in graduate school I would take breaks from my classwork to plan dinner. I was home most afternoons so I could start well in advance. I could make bread sticks to go with spaghetti made from scratch. I could wander the isles of the market looking for the one freshest ingredient that was begging to be cooked to perfection. Now, it hits 4:00 and I send the dreaded “what should we do about dinner” text. Not even, “what do you want to eat”, but “what should we do about it” like canceling or skipping it all together is a conceivable option. Some how I need to get past dinner being a problem that needs solving and get back to engaging and creative cooking. So I need your help. What are you cooking for dinner? Where do you turn when nothing sounds good and you can’t stand another night of take-out? Do you have a Pinterest board where you stash away inspiration? What are you craving? You know what is amazing, meeting people who love food, baking and Olympia as much as I do. 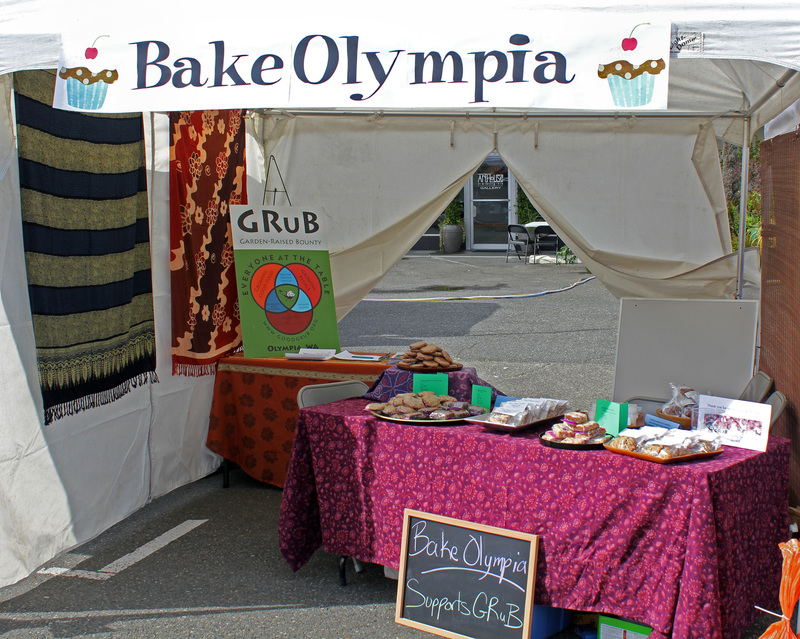 The Bake Olympia booth at Arts Walk was a smashing success. Only in its second year, I think it is becoming a tradition of Arts Walk. It is wonderful to use food to raise money for some really rad Olympia organizations and it is even more amazing to meet all of my fellow Olympia foodies. This year we raised over $600 for GRuB. That’s amazing you guys! I’m so proud of us. For those of you that came down and bought baked goods, THANK YOU! You are the reason our bake sale is a success. 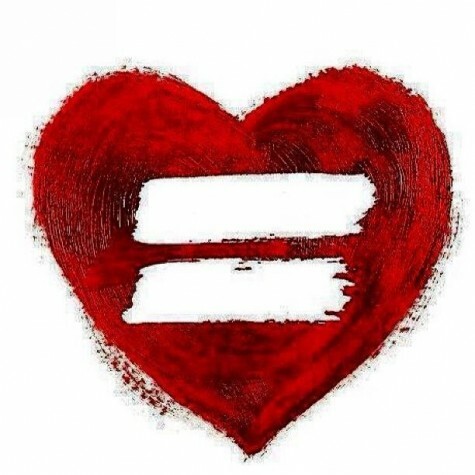 If you couldn’t make it down and would like to donate to GRuB you can do so here, if you make the raspberry coconut bars maybe you could throw a couple of dollars towards GRuB and pretend that you could come down to the bake sale and meet all of us. Thanks to the coconut oil these bars are dairy-free and vegan. If you are familiar with gluten-free flours I’m sure you could easily make them gluten-free to. Spread 3/4 cup of coconut out on a cookie sheet and toast in the oven for about 8 minutes or until it is lightly golden. Check it every few minutes and stir to ensure even toasting. In a food processor, or in a bowl with a pastry blender, blend together flour, sugar, and salt, then add coconut oil and blend until a dough begins to form. Transfer to a large bowl and knead in oats and toasted coconut until combined well. Measure out 3/4 cup dough and set aside. Press the remainder of the dough evenly into bottom of prepared baking pan and spread jam over it. Crumble remaining dough over the jam and sprinkle the last 3/4 cup of un-toasted coconut on top. Bake on middle rack of the oven until golden, 20 to 25 minutes. Allow to cool on rack. When cool to the touch, use parchment paper to lift the bars out of the pan. Allow to cool completely, then cut into squares. 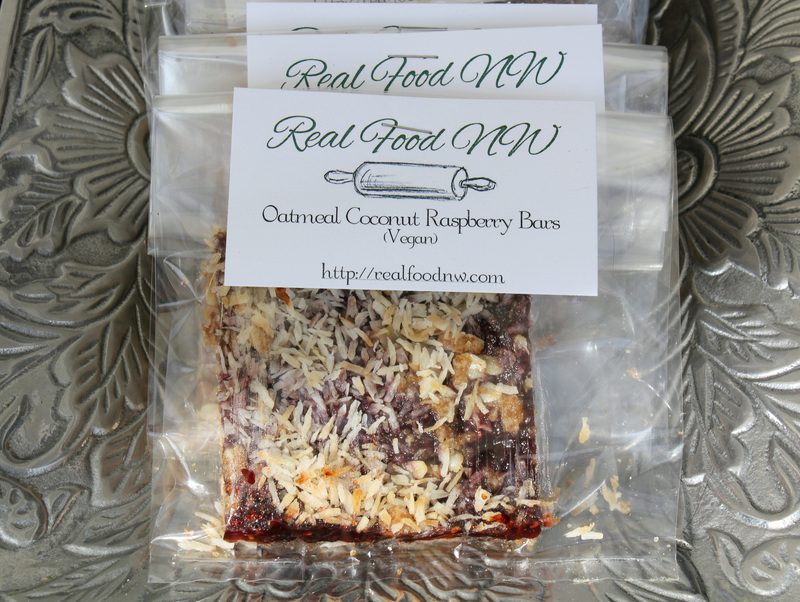 A special note of thanks to Stormans, Inc, owners of Ralph’s and Bayview Thriftway for donating some of the ingredients for the raspberry bars. 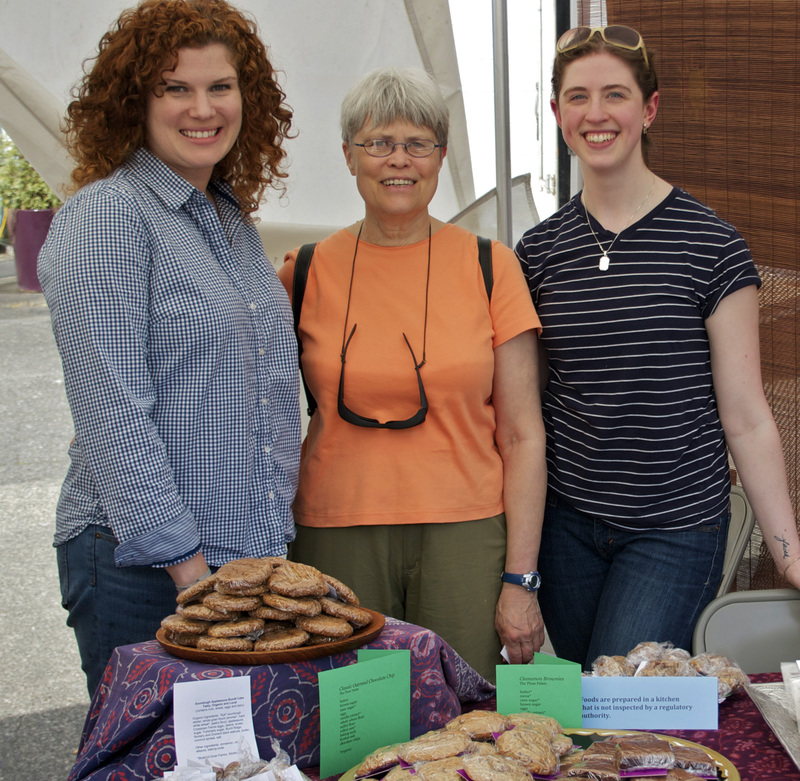 We had so much fun with the food bloggers bake sale last year we just had to do it again. 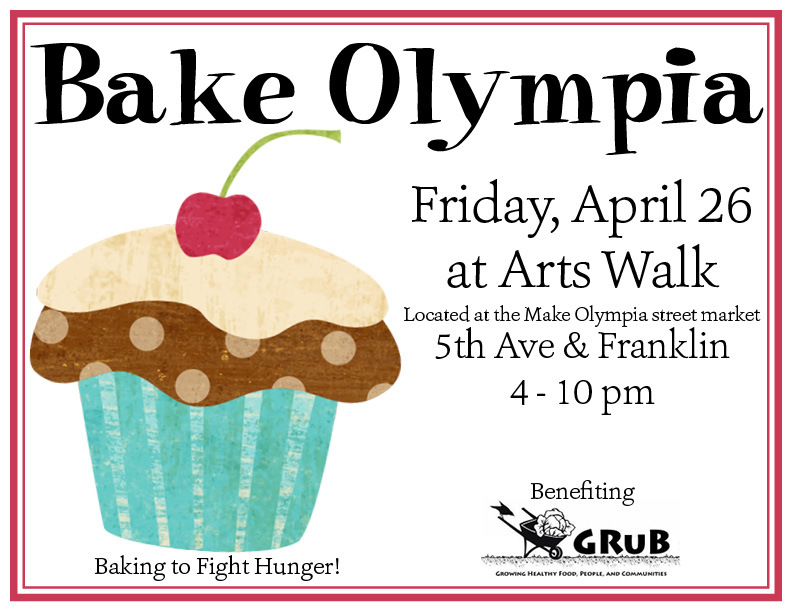 We have some amazing bakers lined up to prepare home-baked goodies all benefiting Olympia’s own GRuB. You can’t go wrong with a bake sale like this! I am excited to see you all at the Bake Olympia booth! If you are interested in baking let me know! 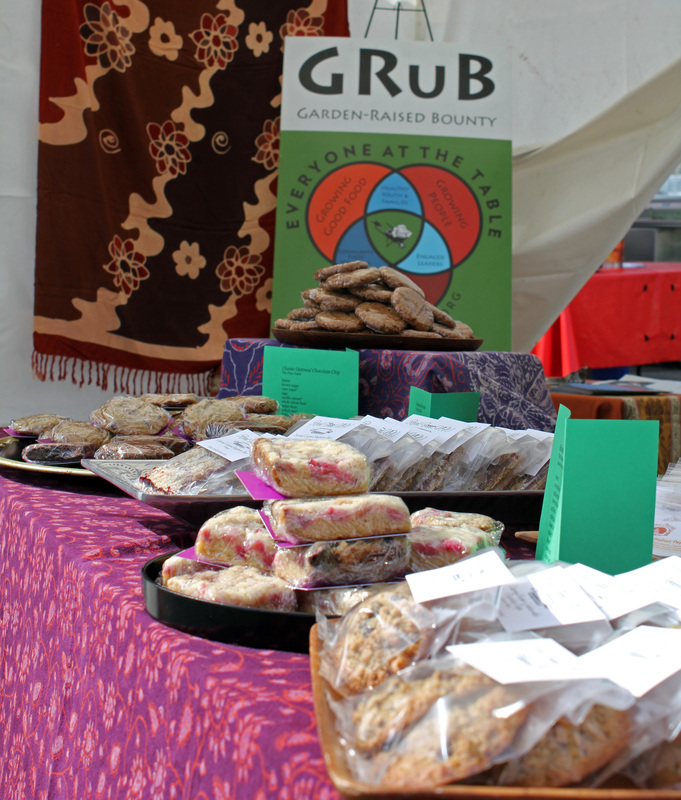 We would love to have more delicious treats to support GRuB! I’m not sure if I’m getting the nasty sickness that everyone around me has, or if I’m just exhausted after a major kitchen update followed by two rounds of houseguests, or maybe I’m just hungover from the wine and chocolate fundraiser we went to yesterday, but I came home and crawled in bed at 4:30 this afternoon. Even though I went to the grocery store on my way home I’m going to be having boxed macaroni and cheese for dinner. It will be the good organic kind with broccoli added, but boxed none the less. Luckily for you, just because I’m having a rather pathetically lazy night (the sky just turned deep grey and opened up with sheets of rain! I don’t feel so crazy for being in bed now.) doesn’t mean I can’t share a great recipe. I have been doing a lot of cooking lately. The change in seasons and a new kitchen will do that to you. 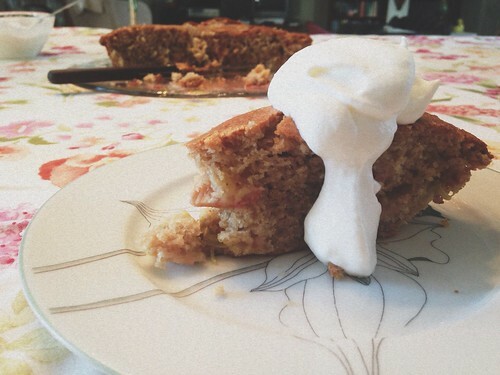 A few weeks ago, when spring was just beginning to show up, I made a rustic rhubarb cake. It was just sweet enough with a dollop of fresh whipped cream. The cake was moist and the little bursts of soft rhubarb were a perfect balance. It was a wonderful way to celebrate the first glimpses of spring. 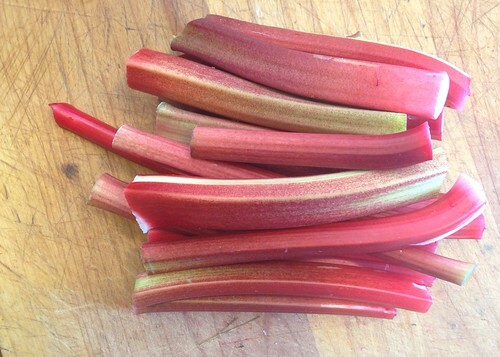 The rhubarb stalks were so new and small that I felt a little guilty plucking them. The remaining stalks are now tripled in size so it didn’t seem to cause too much harm and I won’t harbor any guilt the next time I make this cake. This cake came together quickly and easily. I used the stand mixer to cream the butter and sugar, but you could do it by hand and skip the mixer all together. I love the flavor of cardamom, especially with rhubarb, but it can be strong for some people. Smell it and go with your instincts when deciding how much to add. 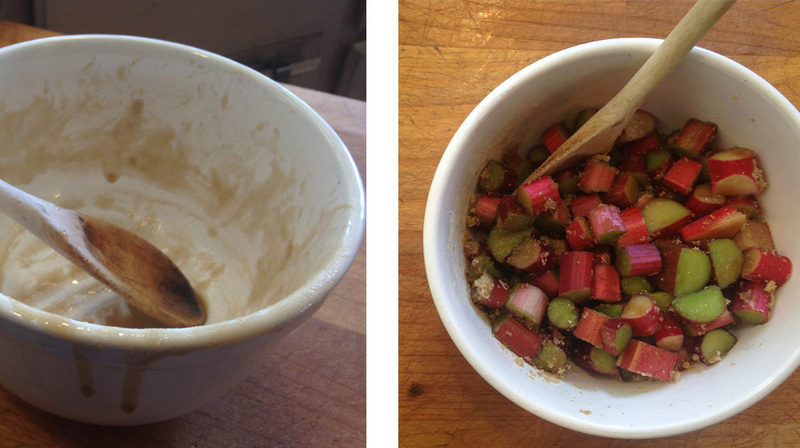 In a small bowl toss the chunked rhubarb with the 1/2 cup brown sugar. Let that sit for 30 minutes. In the bowl of a stand mixer cream the butter and 1 cup brown sugar until light and smooth. Add the egg and vanilla mix well. Remove the bowl from the mixer and add in the rhubarb mixture and yogurt. Stir well. In another bowl whisk together the dry ingredients then add it to the rhubarb mixture and stir well to combine. Spread batter in your prepared pan and bake for 50 to 60 minutes or until the middle of the cake springs back when lightly pressed. Serve with a dollop or two of lightly sweetened whipped cream. Leftovers can be stored in an airtight container for 2 or 3 days.